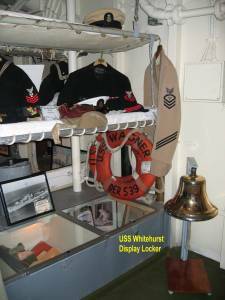 On April 12, 1945, a Kamikaze struck USS Whitehurst DE-634, passed through CIC, and exited the pilot house on the starboard side. The entire bridge was in flames. The 500 pound bomb's delayed fuse exploded about 50 feet off the starboard bow. Forty-two men were lost. When Whitehurst arrived at Pearl Harbor for repairs, May 10, 1945, an entire bridge superstructure was waiting on the dock. I have not been able to determine whether the new structure carried a new bell. 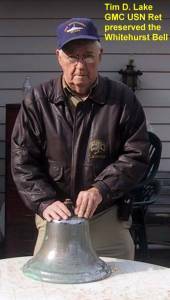 The few WWII vets, with whom I am in contact, do not remember whether the bell was damaged or replaced. A question is outstanding with the Navy Historical center which could possibly solve the mystery. In 1971 shortly before Whitehurst was sunk during the testing of a new torpedo, a wise old Chief “rescued” the Bell. He in turn offered it to GMC Tim Lake, who served on Whitehurst several years. Tim kept it in his garage until April 2005. The ship had been in the reserve fleet at Green Cove Springs, Florida, with her power plant in operation to furnish electrical power to the reserve fleet. She was commissioned in ten working days, which explains some of the initial problems with the ship's operations. Things were so bad that even the ship's bell was broken. 2 September 2005: Dave Harlan, who was the ship's Communications Officer after the 1950 re-commissioning called with this story. "Before the Whitehurst left for the west coast, it had to be inspected by the Senior Destroyer Officer in the Atlantic Fleet. This was the Admiral over Destroyer Flotilla Three in Norfolk. The inspection was such a ridiculous comedy, but that is a story in itself. After the inspection the officers and the admiral's staff met in the wardroom and discussed everything that was wrong. The admiral felt that the Navy should remove the Whitehurst's bell, ship it to the West Coast, and install a new ship under it. 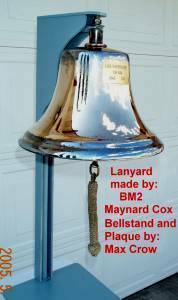 As luck would have it, within two months, the bell disintegrated when we were at anchor off the Coronado Strand in fog. * We discovered that the bell was not solid bronze, but bronze coated pot metal. I believe the new bell was a midnight requisition, from the 26th St. Naval Base, by BM McDermott and QM Denardis. I understand that it may have come from a tug boat. I was in Philadelphia in May of 1953, and met with McDermott and Denardis. One of the incidents they laughed about was the ships bell. 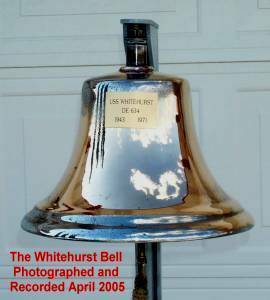 Now we know that we do not have the original Whitehurst Bell and the question arises, "Is this the third Whitehurst bell?" We definitely have the bell that was on the ship the longest. See Bell Comparison photo at end. Tim shipped the bell to me for polishing, photographing, and recording of the sound. 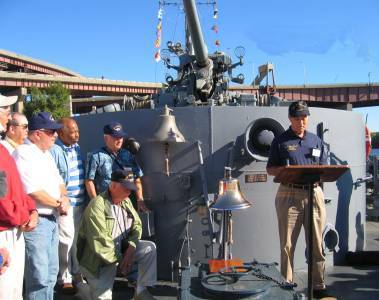 It was displayed at the reunion, September 21-24, 2005 and presented to the DESA Museum aboard the USS Slater DE-766 in a ceremony that took place on the fantail of the Slater, Saturday, September 24th, last day of the reunion. it smartly, honoring our recently departed shipmates. It had lain dormant for 36 years. Now it occupies a place of honor in the DE History Museum, aboard USS Slater DE-766, Albany, NY. Pat Perrella, Curator of the DE Historical Museum. 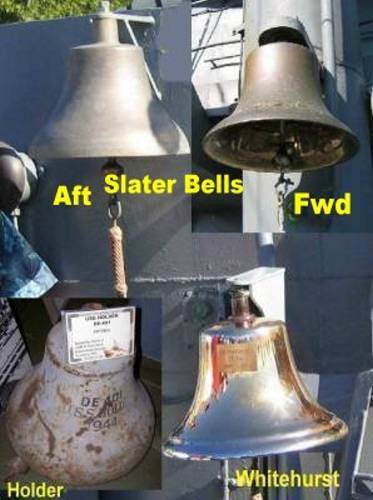 The Slater has bells mounted just aft of the signal bridge and on the aft side of Mt 33.
we should have a "Memorial Bell". I wholeheartedly agreed. 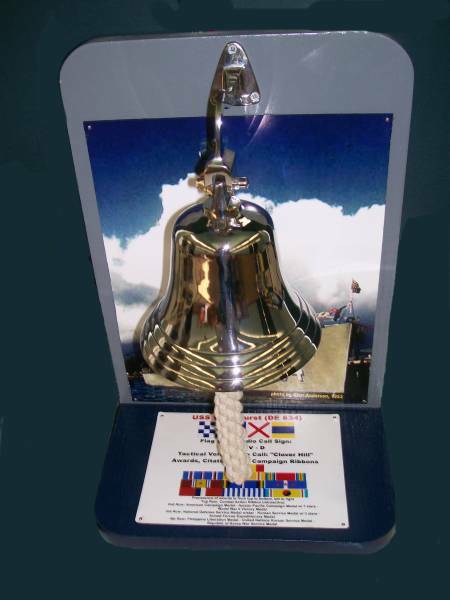 The "small boat fog bell" was obtained and the stand prepared in summer 2011. A special shipping box and canvas bag were also constructed. The bell was inaugurated during the Taps Ceremony at the closing banquet of the Reunion in San Diego, September 11-13, Holiday Inn on the bay. Bell, Stand, and Shipping Container donated by Max Crow and his XO, Christel. note: This web page should open with the sound of the Whitehurst Bell striking 8 bells. However the program code for playing the sound is only compatible with the Internet Explorer Browser. If you accessed this site via the AOL, Google Chrome, or other browsers, it didn't play. If you wish to hear the actual Whitehurst Bell, please open the Internet Explorer and type, or paste, the following link into into the I/E address bar.